When you think of countries facing threats to religious freedom, you may think of Saudi Arabia, Afghanistan, or maybe even Russia. You probably don’t think about France. But you should. A combination of increased immigration and pluralization of European society, terrorist attacks, and the rise of far-right nationalist political parties all pose threats to freedom of belief in Europe. Of all Western European countries, no where does this seem more so than in France. These events seem to suggest an effort on the behalf of the French government to, at the very least fail to provide reasonable accommodations to people wishing to express their faith identity in public, and at the most to completely eliminate all traces of religion from the public sphere. To some people, especially Americans, these may seem like gross violations of human rights. But addressing religious freedom in France isn’t as straightforward as one would think. The history of religion in France, social norms and attitudes towards religion, as well as recent demographic changes add a complex layer to evaluating and advocating for religious freedom in France. Historical factors have influenced social and political norms regarding freedom and expression of religion, resulting in strong public support of separation of church and state in France. During the French Revolution, a movement to “dechristianize” France gained momentum. 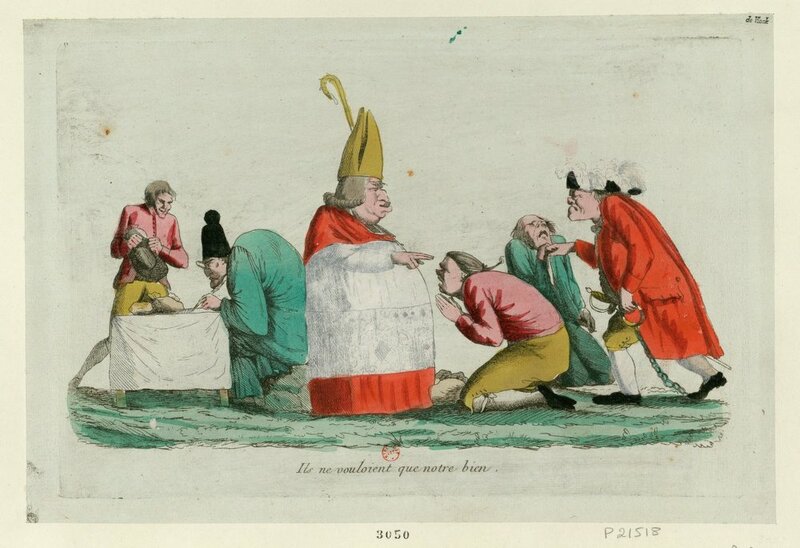 The Enlightenment ushered in a era of thought that focused on reason and science and questioned the wealth, corruption, and control of the Catholic Church in France. Attempts by the new French government to rid France of Catholic influence included deporting and arresting priests who continued to preach, outlawing public worship, closing churches and converting the buildings for other uses, and even implementing a new Revolutionary calendar to replace the Gregorian calendar. (5) Although these restrictions on religious freedom were, to an extent, reversed only two years after they were established in 1793, the foundation for separation of Church and State had been laid. In 1905, the French Law on the Separation of Church and State was passed, marking the formal beginning of laïcité, or secularism, in France. In addition to Separation of Church and State, laïcité also embraces freedom of thought and belief as well as equality of all before the law (regardless of religious belief). As stated on the website of the French Government, “secularism guarantees believers and non-believers alike the right to freedom of expression of their convictions. It also ensures the right to have or not to have a religion, to change it or not to have one.” (6) But the concept of laïcité, as it has been interpreted in modern times, also relegates expression of religion to the private domain. In other words, if you want to express your religion you have every right to do so, but you shouldn’t do it in public, out of consideration for others. Given France’s history and complex relationship with the religion, it is not surprising that secularism has become deeply engrained in French culture and identity. The introduction of devout populations into a traditionally secular and religiously homogenous society has caused intense conflict in France. Religion is very much a part of public life for people who come from Muslim majority countries. Faith is manifested in the way they dress, what they eat, and in a number of other ways. Adapting to living in a country where faith is not a part of public life, and indeed where the majority of people are not religious at all, must be frustrating and confusing at the very least. French non-Muslims who support and pride themselves on their country’s achievement of secularism must likewise find it difficult to understand why newcomers are disinterested, if not critical, of laïcité. Those critical of bans on the wearing of religious symbols or clothing have claimed that the laws disproportionately impact Muslims, especially Muslim women. (8, 9) Some go even further to claim that politicians are using these laws and the concept of laïcité as a “mask for Islamophobia” and that the laws are intended to specifically target Muslims. (10) Indeed, current legislation and prevailing attitudes regarding secularism impact Muslims significantly as for many of them, their faith identities and traditions cannot be separated from their public lives. However, all people of faith, including other religious minorities, are affected by restrictions on religious freedom the government has imposed in recent decades. In addition to Muslims, Sikh and Jewish students cannot attend public schools if they wish to wear turbans or yarmulkes. They were also affected by the unwillingness of public schools to offer alternative lunches that did not include meat or pork. In 2009, Scientology’s Celebrity Centre and bookshop in Paris were found guilty of coercing a woman into spending large sums of money on products sold by the Centre and was ordered to pay 600,000 euros in fines. (13) This marked the first time that the Church of Scientology as a whole, as opposed to individuals involved in an alleged crime, were prosecuted. Additionally, it is important to note that many religions encourage their adherents to donate money or purchase goods or services (the Bible commands Christians to donate 10% of their monthly income to the church), but no other religious group has been prosecuted for such acts in France. There are many places in the world where the state of religious freedom is more dire than in France. In France, people are not being deprived of citizenship, forced to hold religious services in secret, beaten by police, or being targeted for genocide because of their faith. However, this does not mean that what’s happening in France does not have consequences. For the sake of the French people, and arguably the country’s future, France must be held accountable for infringement upon religious freedom. The continued criminalization of religious expression in the public sphere will cause further conflict as France and Europe continue to diversify at a rapid pace in the coming decades. A growing Muslim population, migrant and refugee crises with no signs of being resolved, the continuation of open borders in Europe, and rapid globalization will continue to alter the religious landscape of France, making it ever more important for freedom of belief to be respected. Furthermore, terrorism and the risks of radicalization aren’t going anywhere. Experts predict that as ISIS loses territory, it will increase its terrorist activity, of which France has been a main target (15). As it becomes obvious that homegrown terrorism and radicalization is the future of terrorist recruitment in the West, further alienation of French Muslims may only accelerate radicalization of young Muslim men in France. Thus, it is in the interest of France’s national security to allow and protect expression of religion. A democracy that fails to uphold these values risks illegitimizing itself on the world stage. For France to be a model democracy, as it has been for over 200 years, it must recommit to protecting one of the most basic human rights. Next week, I will introduce you to Eric Roux, an ordained minister in the Church of Scientology and a person of faith devoted to protecting freedom of belief in Europe. This article is part of the Religious Freedom Collection.